Whether you are first starting out using a HUD and poker tracking database or have used one for years, PokrHUD is an excellent choice due to its easy-to-use interface. It provides as much information as you'll need to understand your opponents with the choice of four different HUDs. 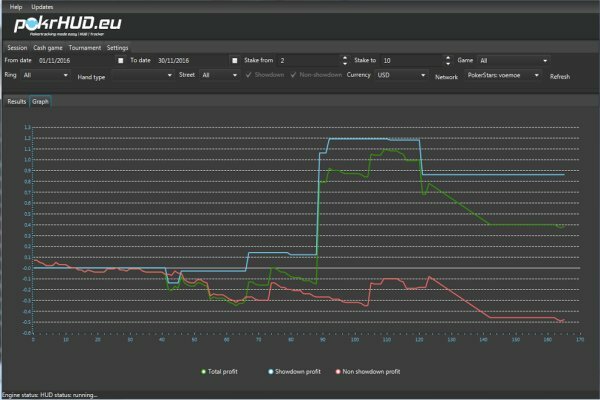 PokrHUD is one of the newest HUDs and poker tracking databases to hit the market. The software provides a simplistic approach to using a HUD, providing four different views without the need to worrying about adding and removing different statistics. Once downloaded, the software is simple to use. Really the only thing you need to do is make sure that your hand history folders are pointing to the correct place, which can be done via a quick auto-detect function. A tracker with a graph and results, compatible with Hold'em and Omaha. your average playing time, average hands played and average profit. As well as the total values. For now a basic overview of all the tournaments played and your profit, no graph. There will be graphs and more advanced features implemented for the tournaments. You will also be able to mark interesting hands and replay them (replayer not done yet). The client will also save your tournament sessions. There will also be more sites added, more games featured and more advanced features in both cash game and tournaments. You will also be able to take quick notes on your opponents and mark them with 'tags', this will however not be done automatically since PokerStars doesn't allow it. Hard to tell, but the free beta will most likely be over by mid-late 2017. I'd say july-september. But anything could happen, might be longer. What will be the final price? Up for discussion, most likely the same as before, but we will certainly be A LOT cheaper than our competitors. You really can't go wrong with PokrHUD if you are looking for a cheap solution for a HUD, as it is priced much lower than its competitors. We recommend you giving them a shot, as the software is easy to use out of the box and won't take hours of customization to take advantage of what it has to offer. easy to install and understand,if you are lazy about fixing the hud,this is what you want,relible as most of the other software on the market but with an amazing price!i have tried a lot of them and i would recommend it to everyone, especially to them that are trying a hud for the first time ! last but NOT least , support is AWESOME ,if you have any issues or question they are there ready to fix/answer them !!! Tried it for a few days, enjoying it so far. Would recommend it. Will probably buy premiun next week! Was helped by support in an amazing way to get it all up and running. Very happy with both the software and the support. Good job!